This is exactly the type of cake my parents love - Greek-style and moist, full of almond and citrus syrup. When they saw the photo in Every Day, they immediately requested that I make it. It contains butter and sugar, Greek yogurt, eggs, orange zest, almond meal, semolina, flour, milk and baking powder, with the egg white being whipped and folded through at the end - this makes it both very moist and very light. After baking, you pour over a syrup made of a spoonful of orange blossom water, and equal parts sugar and water. It looks like a lot of syrup, (and it is! 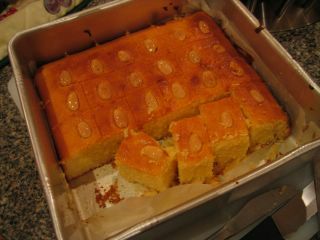 ), but the cake can absorb it all. I poured over the syrup in 3 batches, letting each batch be absorbed before adding the next one, just to make sure I didn't drown the cake. But I'm sure it would be fine if you just poured all the syrup over in one go. The cake tastes just as good as it sounds! I think you're supposed to wait until the cake is cold before you cut it up and start serving, but we couldn't wait. It was a bit fragile whilst still warm, and the first piece broke (oh dear!). The rest were fine, however. It become easier to handle once cold, and the flavour improves the next day, as I can attest.